In our ongoing effort to sustain a safe neighborhood, we wish to ensure that all of our neighbors are prepared for a natural disaster, such as an earthquake or other disaster that may impact the community as a whole. 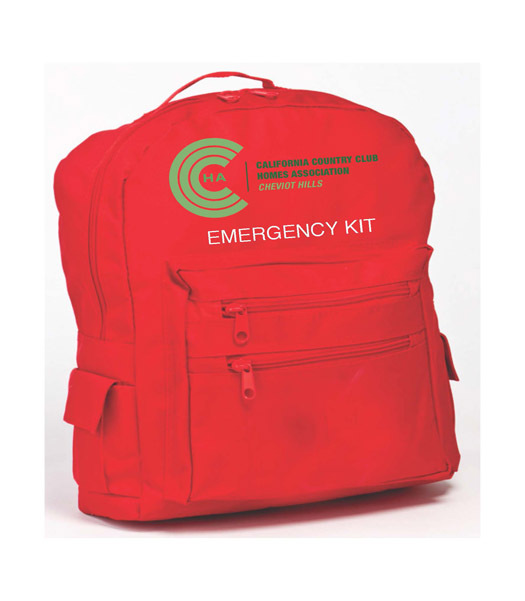 Toward that end, the CCCHA Board has arranged to present to each of you an Emergency Survival Kit. Everything you need for 72-hour emergency survival is in this one complete, portable backpack. Included are food and water for 4 people for 3 days, plus 17 different items. FEMA, the Red Cross, and the State of California recommend that you have these supplies on hand for emergency survival. If stored properly this kit will last up to five years. The kits are available for pick-up at my home. Please bring a form of picture ID and a utility bill evidencing your address. Apologies for our need to be careful, but it’s just one kit per household. If you are aware of a neighbor who, for medical reasons or otherwise, is not able to collect their kit, please make arrangements to collect it for them, or call me at 310.780.9288 for assistance. As always, be safe out there!